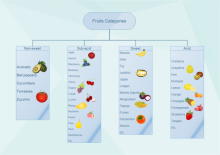 Printable and editable tree charts for download and reference. Take advantage of clear tree charts to learn happily and efficiently. Make tree charts yourself with advanced software, which is fast and fun. 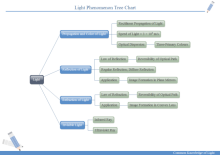 Tree chart or diagram is also referred to as tree structure. It is a way of representing the hierarchical nature of a structure in a graphical form. It is named a "tree structure" because the classic representation resembles a tree, even though the chart is generally upside down compared to an actual tree, with the "root" at the top and the "leaves" at the bottom. For better layout, tree charts are also presented from left to right sometimes. Learning does not have to be boring and tiring. 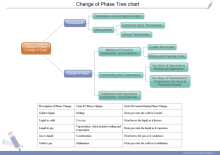 You can actually enjoy the process with some nice tree charts. They will help you comprehend knowledge easily. It is advisable to summarize and sort data for a better understanding. Tree charts offer visualization and order and organization, so they will help you retain what you have leant for longer. Edraw has prepared some tree charts as templates. These templates are perfectly aligned and distributed automatically. Bring fun to learning through various kinds of tree charts. 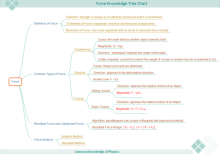 Students can draw tree charts themselves in Edraw for their own purposes. 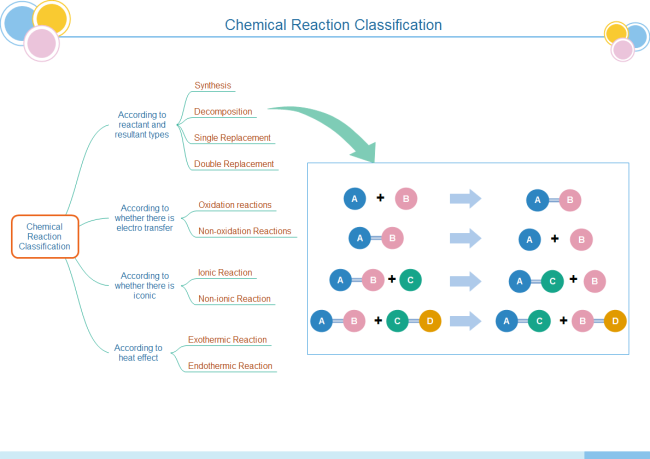 Edraw can also generate many more forms of visuals for chemistry study. The above ideas of basic reaction types can be shown clearly by the following diagram, too. Want easy-to-use software to make tree charts quickly? Rely on Edraw - a professional diagram maker that will help you make polished and personalized tree charts to boost your learning motivation and passion. Along with a large collection of clip arts built in the program, Edraw will generate tree diagrams that are way more interesting and attractive. Included are various vector shapes like Chemistry Equation Software Symbols, Mechanics Symbols, Optics Software Symbols and so forth. If you are time-crunched, use Edraw mind map or flow chart software to get started. These two makers support auto generation and connection of shapes. One click can lay out all shapes perfectly, evenly aligned and spaced. 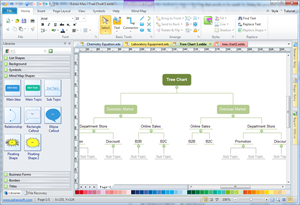 Learn a detailed guide about how to make tree charts. 1. Think and analyze chemistry at atomic and molecular level. Use some vector molecular models symbols to ease your chemistry study. 2. See chemistry in 3D, not the 2D drawings like in your textbooks. 3. Trace chemistry in electronic structures. Electrons-electrons-electrons, that is what chemists care about. 4. Imagine chemistry in molecular ensembles. One atom or one molecule don't mean a thing, they are always in groups, many millions! Don't forget their inter-molecular interactions. 5. Learn to draw chemical structures in electron dots and in 3D. Rely on Edraw for easy drawing. 6. 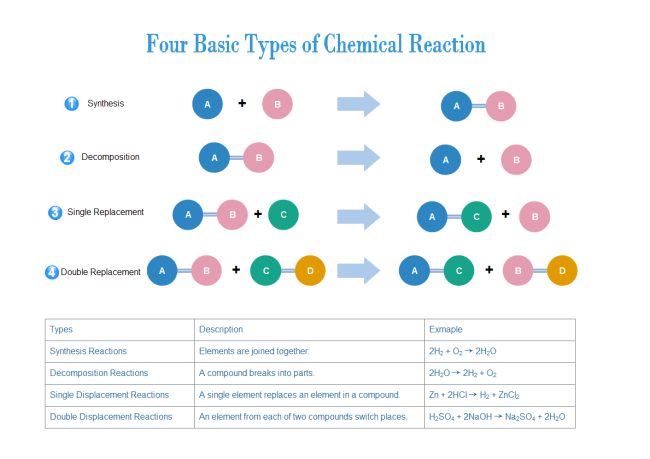 Visualize chemistry through various kinds of diagrams. Adapt a more visual learning instead of static texts. Remember to take advantage of our tree charts above. 7. Learn chemistry live from chemists, not self-study from a textbook. Let a qualified teacher teach you and save your struggle by yourself. Discuss with your partners frequently for better ideas.